At Hair of the Dog, we believe that regular bathing and grooming are essential elements for a happy and healthy pet. 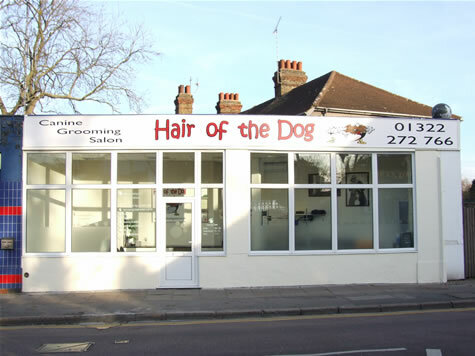 Our grooming salon in Wilmington, near Dartford is equipped with deluxe grooming equipment for the welfare of your dog in order to ensure they have the most comfortable and happy grooming experience possible. The salon is also fully air-conditioned (which is lovely and cool for them in the summer months), and also heated (for the cold winter ones!). We do not believe in caging dogs here at Hair of the Dog. All dogs are attended to on a one-to-one basis. This enables your dog to have the groomers sole love and attention, and also helps to enable a bond to be established. Please be rest assured that your dog is given plenty of love, care and attention by either myself or my fellow colleagues. All dogs are lovingly brushed, bathed and gently hand dried and hand scissored or clipped to a professional standard. They are then provided with a warm, comfy bed to relax in while waiting for their collection. Whether your best friend just requires a pedicure, a nice bath treatment, or the full head to tail treatment with a beautiful clip or trim, we can guarantee they will be shown plenty of love and kindness here at our salon.